To open the trunk, insert the key into the lock and turn it clockwise until an audible “click” is heard. 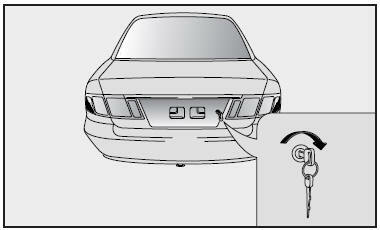 To close the trunk, use both hands to push the trunk lid down until the lock “snaps” shut. Do not slam the trunk lid. Pull up on the trunk lid to make sure it is securely latched. To prevent premature wear or damage to the trunk lid lift cylinders and attaching hardware, the trunk lid must be fully closed before you drive your vehicle. If you drive with the trunk lid open, you will draw dangerous exhaust fumes into your vehicle. If you must drive with the trunk lid open, keep the air vents open so that additional outside air comes into the vehicle.